Hundreds of Savannah residents joined forces to clean up their neighborhoods on Saturday, as officials launched the next phase of an ambitious litter education campaign and Police announced a new initiative to crack down on litterbugs. The far-reaching actions focused on litter came during the Great Savannah Litter Pickup. More than 80 civic organizations participated in the major effort . Bags of litter collected during the morning neighborhood cleanups were hauled by Sanitation workers to Thomas Square, the site of the Great Savannah Litter Pickup News Conference. 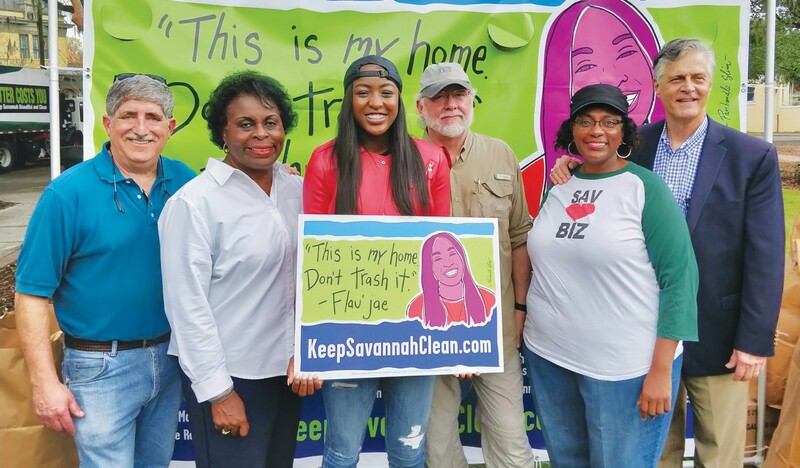 There, Keep Savannah Beautiful Chairwoman LaToya Brannen promoted a new Adopt a Spot program intended to encourage yearround litter cleanups. “We currently have more than 40 partners working with us in that effort, but there’s still a great need for volunteers,” says Brannen. Parker’s CEO Greg Parker, Co-Chairman of the public-private partnership Keep Savannah Clean, unveiled the next phase of a new anti-litter campaign designed to change behavior. The campaign features many of Savannah’s shining stars in TV commercials, billboards, yard signs, radio and social media posts. Original art by Savannah artist Panhandle Slim will grace billboards, ads and yard signs, which will be available to the public at Parker’s stations, City Hall and other locations. On Thursday, Savannah City Council passed a new law, called the Clean Community Ordinance, that better defines littering, and sets a fine schedule for those caught littering. Savannah Police will use this new ordinance to launch a new Police litter enforcement initiative. Officers will not be redirected off their normal beats to catch litter bugs. But if an officer sees someone littering, that officer will use his or her good judgment and issue a citation, if warranted. Minimum fines are $50 for a first offense, $75 for second offense, and $150 for third offense.